Ofgem is clamping down on suppliers that have been blocking services that automatically switch customers to cheaper energy deals with rival companies. Bulb, First Utility, and OneSelect have all been found guilty of blocking switches made through automatic switching services, such as Flipper and Switchd. No fines have been dished out, as yet, but the energy regulator has ordered these suppliers to stop. But are there any circumstances in which your supplier can stop you from switching? Can your energy supplier block your switch? Switching energy supplier is surprisingly simple, and once you’ve agreed a new deal, you should be with your new supplier in just 17 days, which includes a 14-day cooling-off period. If you have an outstanding energy debt with your current supplier, and the money has been owed 28 days or more, then your move can be blocked until this debt has been paid. Your supplier might insist on installing a prepayment meter to help pay off the money owed. If you already have a prepayment meter installed, you can switch supplier unless you owe more than £500 for gas or £500 for electricity. When you switch, you’ll need to ask the new supplier to agree to transfer your debt along with your supply (this is called the ‘Debt Assignment Protocol’). If you’ve owed money for less than 28 days, you can still switch supplier, but be aware that the debt will be added onto your final bill. If you decide to switch because your supplier is putting up its prices, you’ll have 30 days to pay off the debt before they can block your switch. And if the debt has built up because of a mistake by your supplier, such as a billing error, you can still switch and the debt will be added onto your final bill. If you’re on a prepayment meter, or have an Economy 7 or Economy 10 meter installed, you might not be able to switch if the new supplier or tariff doesn’t support those types of meter, else have standard meter installed, which your new supplier might charge you for. If you live in rented or shared accommodation, you may not be able to switch without permission from the property owner or whoever’s name is on the bill. If you are responsible for paying the energy bills at the property, and the bills are in your name, then you have the right to choose your supplier. 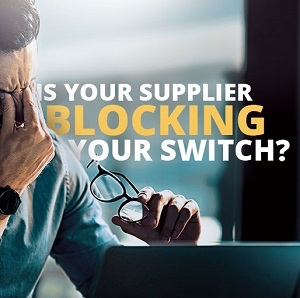 What if your supplier is stopping you from switching? If none of the above applies to you, and your supplier is blocking your switch even though you’re entitled to transfer to another supplier, you’ll need to make a complaint. For full details of how to complain, and who to complain to, check out How to make a complaint about your energy supplier. UKPower customers haven't encountered the problems that have beset some custoemrs using automatic switching services, but even though Ofgem is ironing out these issues, automatic switching has some additional problems. What's the problem with automatic switching? UKPower has been helping people switch to a better deal for over a decade now, and the process couldn’t be simpler – just enter your postcode in the box at the top of the page, and you’ll be taken to our uSwitch-powered comparison tool. Enter a couple more details on your current energy deal and annual usage – if you don’t have this to hand, we can run a comparison based upon the size and type of property you live in – and we’ll show you a list of deals that could potentially knock hundreds off your annual energy bills. You just then pick the deal that’s right for you, and we take care of the rest. It really is that simple. If that’s not enough, switch with UKPower before the end of July, and you could win an Amazon Echo Show. With automatic switching services though, you’re automatically switched to a different deal as soon as one is found that that can save you at least £50 a year on your current contract, including any early exit fees. Switches are only carried out once you’ve given the automatic switching service provider your permission, which, on the face of it, sounds like a good deal. But it’s not without it’s snags. Unlike UKPower’s switching service, which is comprehensive and completely free-of-charge, automatic switching services either charge a monthly usage fee, or only use a limited of suppliers, each of which pays a referral fee each time a customer makes the switch to them. So, using an automatic switching service will either eat into the money you save on switching, or offer you a limited range of options, so you can’t be sure you’re on the very best available deal. There’s also no provision for quality of service with automatic switching, and the switch is made purely on price alone, meaning you could be switched to a provider that has billing or customer service problems. Earlier this year, for instance, Flipper switched customers to Iresa, a small supplier plagued by customer service problems so severe that Ofgem has extended a ban on it taking on any new customers. Switching with UKPower means you’re always completely in control of the switch, and to help make sure you’re on the very best deal to suit your needs as well as your budget, we’ll let you which deals have exit fees, which deals use green energy, and how well each supplier scores when it comes to customer service. While we provide the quotes, the final decision is always with you – to switch to a better deal, enter your postcode at the top of the page, or give us a call on 0800 320 2000.